It’s officially springtime, and with a new season comes new ways to focus on the health of your home and HVAC system. From allergens to temperature changes, we’re definitely beginning to feel the effects of the season of renewal. 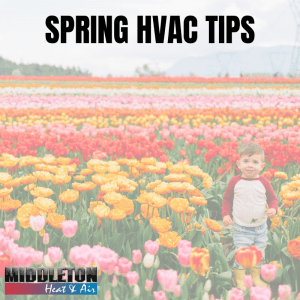 The professionals at Middleton have a few tips to help you keep your HVAC system running smoothly in the coming months. As we always say, preventative maintenance is the top solution when it comes to maintaining HVAC efficiency. Schedule a spring appointment, and one of our qualified technicians will help you lower your utility bills, improve your indoor air quality (which is especially beneficial to those with allergies or respiratory problems), and keep your family safe by checking for carbon monoxide. Is your thermostat easily heating and cooling to the temperature it’s set to? If not, let one of our technicians know. You should change your air filter about once a month, and spring is a natural time for your filter to collect pollen, dust and mold. A high-efficiency filter can help relieve you of your allergies by clearing the air in your home. It’s also important to note that a dirty air filter will reduce overall air quality and increase energy costs as well. Spring is the perfect time for a system replacement, and the professionals at Middleton can install a new air conditioning system before temperatures rise to an uncomfortable level. Don’t wake up sweating only to find that your old system has stopped working properly. Stay a step ahead, and let a qualified technician get a new, efficient system up and running in your home while you’re getting some spring cleaning done. Ready to schedule an appointment with one of our qualified technicians? Visit us online or give us a call at 1-800-404-0371 for a quote.